LEAVES......... Sometimes, life happens. Ken and I celebrated our 38th Wedding Anniversary yesterday in our rather usual quiet way. He took me out for Chinese for lunch. After over indulging, we decided we wouldn't be able to sit through the matinee we'd planned to attend. It felt more like nap time, so we went home and tried to keep cool with triple digit temperatures outside. We then made it to the 4:35 pm matinee movie. We saw 'The Proposal' a funny, and heart-warming romance story with Mary Steenbergen and Sandra Bullock. Anyway, blogging didn't get done. So let's get going on the rest of the freezer paper applique method. The edges of the leaves are all glued. Then I put a little more glue on the back of the leaves, and placed them on the background squares. The glue acts as basting. I hate trying to hand applique around pins. The glue actually works better than pins. 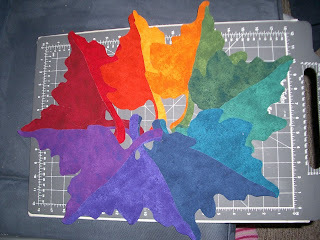 I like to run a bit along all the edges, and some through the centers on larger pieces, like these leaves. Then, I begin the actual applique stitching. 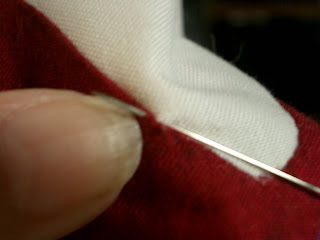 Use thread that closely matches the applique piece. If you cannot match it exactly, go just one shade darker, never lighter. 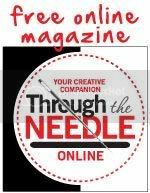 Thread the needle (I prefer John James brand Gold'n Glide applique needles, size 10.) For thread, I use either aurifil 50 wt. sewing thread, or a single strand of DMC embroidery floss. 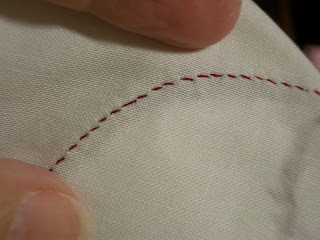 Make a knot in the end of the thread, and bring the needle up through the background along the edge of the applique. 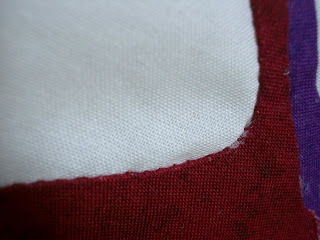 Take a tiny stitch in the edge of the applique and bring the thread up. In one motion, take a small stitch—no more than 1/8" in length—in the background and bring the needle up through the edge of the applique catching 3 or 4 threads of the applique fabric. Continue stitching in the same manner. Stop every 3 or 4 stitches, and tug a little on the thread. Your stitches should just melt right into the piece, and disappear. Tie off, and start a new thread as needed. I like to take two or three very small stitches in place on the wrong side of the piece, than run the needle between the applique and the background fabric about 1/4" before cutting the tail of thread. When finished, the stitches will look like this on the underside of the square: And like this on the right side. Note how the stitches virtually disappear. Now, the freezer paper has to come out. 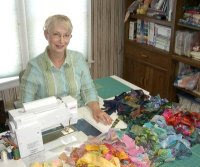 Some quilters like to use a stabilizer-like product instead of freezer paper, so that they do not need to do this next step. Since I really like to hand quilt, I don't like that extra layer in my quilts to stitch through. 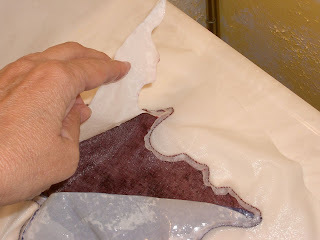 To remove the freezer paper, trim the background away from under the applique. Make a small snip in the background fabric, slide the point of a small scissors in the hole and work your way toward the edge of the applique. 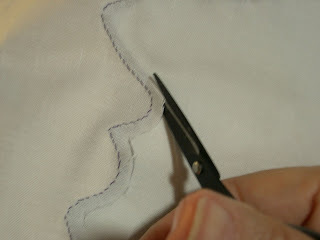 Trim the fabric approximately a scant 1/4" away from your applique stitches. Discard the background piece that you've cut away. Be careful with this step. Even though the freezer paper make a nice barrier between the scissor point and applique fabric, it is still possible to snip a hole in the applique. The next step is to soak the square in warm water to soften and remove the water soluble glue. Ten minutes is usually long enough to loosen the paper. It should come out easily. 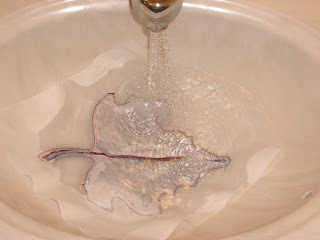 Sometimes, I return to the bathroom sink to find the paper floating at the top of the water. Discard the paper. Next, roll the square in a terry towel to absorb most of the water. Turn the piece wrong side up on a padded pressing surface, and iron dry. 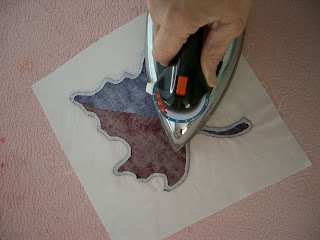 Make sure the surface of your iron is clean before doing this, though, or you may get some staining on light fabrics with this step. 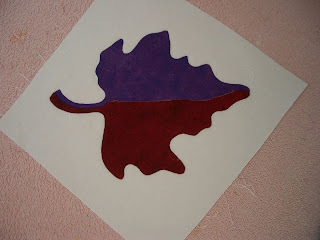 NEXT LESSON: Reverse Applique I decided these leaves were so large that there needed to be something inside to indicate vanes, and to give the leaves definition. Because the vanes are narrow, and would be difficult to applique, reverse applique is the key.